The Five-star Movement owes its success to, among other things, its capacity for breaking political taboos. It has been doing this through the nature of its communication styles, with its tendency to question the basic assumptions underlying the political game itself. The Movement became a party or rather, while remaining a ‘movement-party’ it reinforced the party element. This transformation has led it to break many of its own taboos, to question the traits that had made it distinctive when it first emerged. 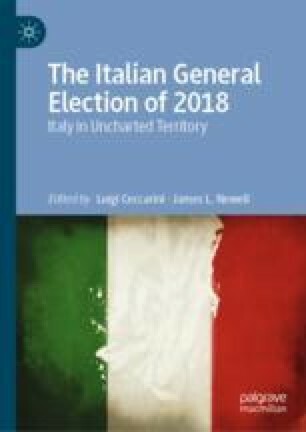 The need to present itself as a potentially governing actor drove the M5s to redefine the nature of its internal organisation and its relations with the mass media, to revise the substance of its political message and its approach to democracy. Finally, its success at the 2018 elections has since led it to question the ultimate, and potentially the most insidious, taboo: the taboo against the formation of alliances, which was broken in the aftermath of 4 March with the contract for government agreed with the League. Maestri, G. 2017. Il “nuovo” M5S: la terza associazione, con simbolo in prestito. www.isimbolidelladiscordia.it. 30 December.